System limitations – Plugins and stores available for the given tenant may be limited in this section. By unchecking the “Unlimited” checkbox you open the list of plugins/stores. Check the plugins/stores that the tenant should be allowed to use. Email archive limitations – If the Email archive plugin is allowed, the administrator may limit the mailbox count, email(s) count, email(s) size that the given tenant will be able to archive. 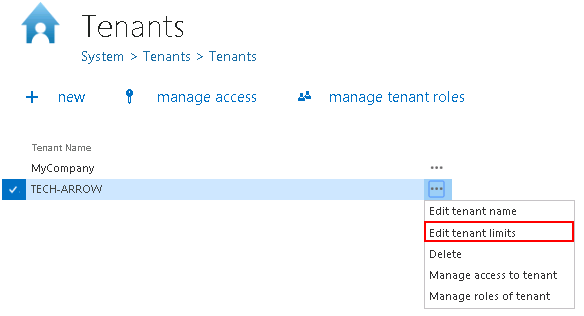 File archive limitations – If the File archive plugin is allowed, the administrator may limit the root folder count, file(s) count, file(s) size that the given tenant will be able to archive. If the Email archive limitations and File archive limitations text boxes are empty, this means that the allowed mailbox/root count and email/file count and size is unlimited. The tenant administrator may see his own limitations only in read only view.